The Fig. 7025 Packaged Scrubber System is a completely "packaged", movable gas scrubber separator system that is designed for use in pilot plants, laboratories, or temporary locations in full size processing plants. The Fig. 7025 Packaged Scrubber System uses water or other liquid to clean large quantities of objectionable gases that are inherent in most laboratories or processing applications. The Fig. 7025 Packaged Scrubber System can achieve contaminant removal efficiencies as high as 99.99% in many applications.This package typically consists of a Fig. 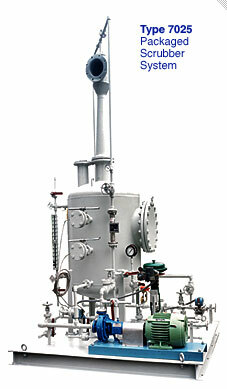 7010 Ejector Venturi Gas Scrubber and Fig. 7040 Separator with storage mounted on a steel baseplate. Depending on the customer’s requirements, pump and recirculating piping may be supplied. Optional accessories may include a heat exchanger, a level gauge or alarm or an additional liquid storage tank. Since all Fig. 7025 Packaged Scrubber Systems are custom sized and designed, design temperature and pressure will be accounted for on an individual basis. The Fig. 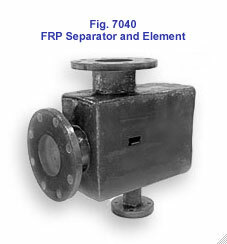 7040 Separator uses a special S&K designed impact baffle separator element to direct the downward discharge of a Fig. 7010 Ejector Venturi Gas Scrubber through a turbulent 90 degree bend of direction into a sidewall. There, an inertial separation occurs as the impacted liquid drains downward and the gas stream, free of liquid, reverses its direction and heads out of the separator through a nozzle located opposite to the region of liquid-air impact. Fully customized, complete engineered solution. Versatile, flexible, and expandable. Tolerates system upsets. The Fig. 7040 Separator is recommended whenever space for gravity separation is not possible, desirable, or combined discharge of the liquid gas streams is undesirable. The continued contact through the impact baffle aids scrubbing efficiency. The unit is more compact than a gravity or cyclonic separator. Units can be designed with or without liquid storage capacity. Scrubbing of metal treating emissions. For more detailed information about Packaged Scrubber System, Bulletin 7S and Bulletin 7S Supp. Literature. To submit a Request for Quote (RFQ) for Packaged Scrubber System, Adobe PDF or submit an online interactive RFQ Form for Scrubbers.